Baby Rec. - Babycare Recoard with easy tap! of the interval of breastfeeding. when we rushed to hospital. Babycare Record with easy tap!! 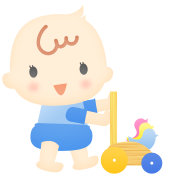 Input baby's behaviors by cute icons. Fast and easy edit (jot, changing time etc.). You can check the archived record immediately. Check the previous records at a glance!! As not just "List view" but "Week view" is available, you can see baby's life rhythm visually. You can also record the anniversary date (e.g. first walking, talking).